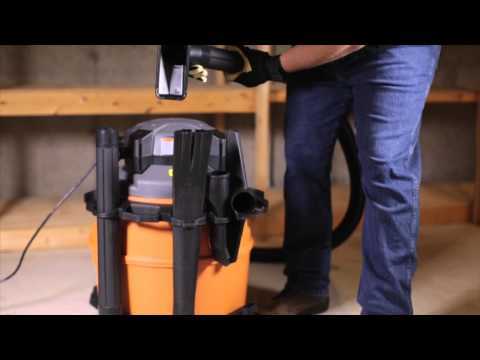 This newly designed RIDGID® 16 gallon wet/dry vac is a multifunctional powerhouse. Its powerful motor and large drum size allow it to perform extremely well as a conventional vac. In addition, the vacuum’s power head detaches and quickly converts into a 180 peak MPH handheld blower with a locking blowing wand that outperforms most dedicated leaf blowers. The quick-release cord wrap lets you spend less time unwrapping the 20’ cord, and more time on the job. The caddy conveniently keeps your accessories and hose close at hand. It’s like two incredible tools in one. Detachable hand held blower provides 180 mph wind for removing debris from walkways, decks, yards, driveways, job sites, tools, etc. Performance meets or exceeds that of dedicated lawn & garden leaf blowers. New, dedicated blowing wand positively locks into the blowing port so it won’t blower loose. 6.5 peak horsepower motor provides maximum power for the heavy-duty pickup of water & debris in the shop, basement, garage or on the job. Scroll Noise Reduction® is a patented feature that provides quiet operation by precisely controlling the flow of air through the vac. Four swivel casters provide 360°, freewheeling maneuverability of the vac when pushed or pulled in any direction. Innovative accessory storage provides space for 7 individual items. No more searching or fumbling to find accessories.1-Layer Standard Pleated paper filter captures common everyday dirt. 1-Layer Standard Pleated paper filter captures common everyday dirt. 20’ Extra long power cord accommodates wide area cleaning. Large built-in drain located at lowest point of drum for emptying of water. Click on a Catalog Number link to view its Standard Equipment. 16 Gallon Wet/Dry Vac with Detachable Blower is rated 4.7 out of 5 by 424. Rated 4 out of 5 by VersyeJr from Pretty good Only used it once so far and so far it's pretty good. Good suction, and that's all that matters for a vacuum. Rated 5 out of 5 by PQ15102 from Great shop vacuum Just replaced my old sears shop vac. The rigid has 25% more HP. Works well. I had a small issue with a minor broken part, in shipment. Beth, of customer service, did a great job of getting me that part plus an extra filter for my trouble. Thanks Beth!! Rated 5 out of 5 by CBercy from Works well and the detachable blower is fantastic. The detachable blower is a game changer. Easy to use and very powerful. The vacuum has a large capacity. Rated 5 out of 5 by JMer from Durability I think you can throw this vacuum down the Grand Canyon and it’ll still work. I put a sticker on mine that reads “This vacuum climbed Mt Everest”...the piece is a beast. My vacuum has been through the most extreme conditions when in use. The kids even used it in the cat litter box for months. My basement flooded once and this vacuum worked better than the sump pump that never started! The removable blower has been used a lot in the garage after my wood building projects. It’s not cordless but it is perfect for use after small or big projects in an open environment as the garage. It is also great to dry out floors on rainy days or after mopping. We have used it to it’s full capabilities (or so we thought) and the vacuum runs as if it was brand new. Had it for nearly three years now and it hasn’t lost power at all. We use this vacuum for EVERYTHING! We got rid of those “house expensive vacuums” that die out after 6 months and use this RIDGID instead. We even use it when we groom our three German Shepherd Dogs! Only heaven this vacuum sees is when it’s not in use. Otherwise we torture it and make it work hard! Rated 5 out of 5 by PB54 from Very happy so far with these 4 Ridgid vacuums bought at Home Depot These vacuums seem a lot better than the ones I used to buy and I hope I won't be disappointed in the future after a long and good use I will do with these 4 vacuums from your Company... Price was right and the fact that Home Depot sells this brand put me in trust and confidence with your products. Rated 5 out of 5 by Timthetoolmantaylor from Works really good. This vac has lots of power and the detachable blower is a nice feature. I rated the durability a 5 but I haven’t actually had it for too long so hopefully it holds up. As with all rigid products it was easy to register. hi ... have the wd1665 model of the 16 gallon wet/dry vac. this unit has been great, but now notice that when i switch the unit ON, sometimes I have to giggle it a little to get it to start. Any ideas on how to correct? Do these switches wear out? thanks. Switches can go bad and wear out. It could be just a loose connection also? I would first spray some alcohol into the switch itself and around the switch housing because sometimes the contacts of the switch get dirty. Let this dry for a minute or two and then try it and see if it works. If not then If the machine is not under warranty you should be able to take it apart by removing some screws and the unit should separate into two pieces. This should also give you access to the switch. From their you can determine if it's a loose connection or a bad switch? Hope this helps? I HAVE CHANGED THE FILTER, CHECKED THE HOSE FOR DEBRIS, AND THE HOSE INTAKE PORT. MY VACUUM IS STILL WORKING AT ABOUT %50. I have only had my unit for about a month and used it very little. can i use my 16 G, blower vac too for blow in fiber insulation? trying to use the blower feature, but am not sure if this is possible with this model, already bought and extra 8' line, (16' total line), as the area is tight, but improperly insulated. the filter seems as it will deter this and removing the filter i think may clog up the motor. thank you in advance for all responses. I would advise against what you are trying to do. This blower is not designed to blow things through the device. You could try to build a &quot;fill system&quot; and connect it to the hose itself. I am not sure if it will work, but I would give that a try before blowing insulation through the actual motor unit. Can you buy the blower attachment by itself. How do I hook an attachment to the blower? My blower has, what looks like a vent, where the attachment should go. I cant seem to remove the vent part. Did you get or can you locate your owners manual for your vac? You might even be able to go on the rigid web site and download the owners manual for your device? This should tell you how to hook up an attachment to your blower. You might even be able to find a YouTube video on it? Who knows their are videos on just about anything these days? My blower attachment locks into the blower port. Mine works like this I push the blower attachment into the blower port and then turn it clockwise until it locks into place which is great because you don't have to worry about it falling off or the blower blowing it off like on my older sears model I have. Hope this helps!